I didn’t realize that it was possible to wear out a pair of Crocs, but due to my odd gait I’m now sporting a hole in the heel of the left shoe. A friend got them for me a couple of years ago, and I’ve worn the ugly things daily since then, even in the snow (my bad hip makes it impossible for me to bend over far enough to put on socks, anyway). They’re cheap, and I’ll be happy to give Walmart more of my money to get a new pair. Let’s be brutally frank, shall we? We’ll see a Tiny House Village (like the one below) here in Boulder, CO when the devil straps on ice skates. It doesn’t involve millions and millions of taxpayer dollars — serving a relatively small number of the homeless population like the horribly inefficient Housing First model — and nobody is getting awards and nationwide recognition for actually addressing homelessness in a reasonable way, ASAP. Instead, let’s have another phony 10-Year Plan to End (or to “Address”) Homelessness, and continue to make the problem bigger! More backslapping congratulations for Greg Harms and Betsey Martens, too, in case they don’t give themselves enough credit (admittedly, this is unlikely). 2) Other bums will be sleeping in the loo. A special announcement will be published here tomorrow! Stay tuned . . . This entry was posted in Homelessness, Only in Boulder, Politics and tagged 10-Year Plan to End Homelessness, Betsey Martens, Greg Harms, Housing First, Jared Polis, Tiny House Village on March 31, 2015 by homelessphilosopher. 2) More money will be spent, lots more money, to little or no positive effect. Homelessness is one example; municipalization of the local electric utility is another. > I’m enjoying the warm weather these days, and I wish to invite anyone who wants to do so to stop by the corner of N. Broadway & U.S. 36 to say hello. If I’m not playing the role of humble beggar there in the afternoon, I’ll be sitting on the wall in front of the nearby Mexican restaurant reading a book. Don’t be afraid, if you’re one of the anonymous cowards from the Daily Camera website — I’m really a big teddy bear and wouldn’t hurt a fly. > Not much going on in re homelessness, but I don’t hang around with the small minority who are scumbags, so if they don’t make it into the newspaper for some reason I’m blissfully unaware of their drama. I’m just counting down the nights until Boulder Shelter for the Homeless closes its overnight emergency dorms for men and women, after which it will be much more pleasant in the mornings for us hardy outdoor-types who come for a hot shower. > Tonight at my campsite: Ecce Panis bread from King Soopers with marinara sauce for dipping. It tastes great, and is also soft enough for me to chew. Other artisan breads I’ve tried could be used to club down the bums who roam around my neighborhood, looking for stuff to steal, but even so a baseball bat is a better choice. This entry was posted in Homelessness, Only in Boulder, Politics and tagged Boulder establishment, Boulder Shelter for the Homeless, municipalization on March 30, 2015 by homelessphilosopher. Easy for me to believe, given that there are several cyberstalkers here on the Daily Camera website: mstdye/bndr, travispickle, haydukelives1, haydukelives2, haydukelives3, et al. I hope they don’t try to hurt anybody with a knife, but you never know . . . 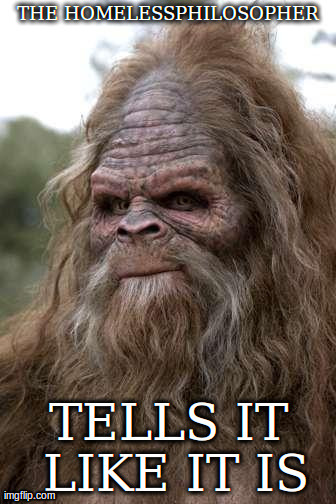 I don’t have any lights at my homeless campsite, nor do I light candles there. Sorry, but I’ll have to pass on the St. Julien, too. Earth Hour seems like an event for the well-heeled, who wish to feel good about themselves — which is the same reason they support the FAILED homeless shelter/services industry here in Boulder, CO. Just another wealthy elite affectation. The 32 people indicted in the case range in age from 25 to 71. They [face various] charges of racketeering, felony cultivation and distribution of marijuana, money laundering, tax evasion, attempt to influence a public servant and conspiracy. Those charged are: Tri Trong Nguyen, 39; Thomas Claire Dispanet, 40; Cuyler Gerbich, 39; Kristine Claretta Root, 37; Michael Patrick Glick, 34; Aaron Matthew Ellering, 39; Aubrey Charles Keesling, 39; Ryan Joseph Farrow, 30; Josie Phuong Farrow, 43; Sheila Thi Kieu Lorenz, 45; Oanh Tran, 48; Veon Deloy Hatch, 42; Patrick Joseph Concannon, 37; Joseph Johnson, 43; Nicholas Alan Kuhl, 37; Douglas Dunlap, 47; Micah Peterson, 33; Antonio Domenico Orfei, 33; Lindsay Geinert, 37; Andrew James Wylie, 37; John Rodger Magee, 37; Jessica Peterson, 34; Alicia Rainey, 71; Anh Thi Nguyen, 37; Jason Joyner, 28; James Chad Averette, 28; Tiffany Gille, 34; Everett Grove, 25; Adam Tilley, 28; Anthony Smith, 27; Matthew Olson, 40; and Jordan Iovinella, 34. 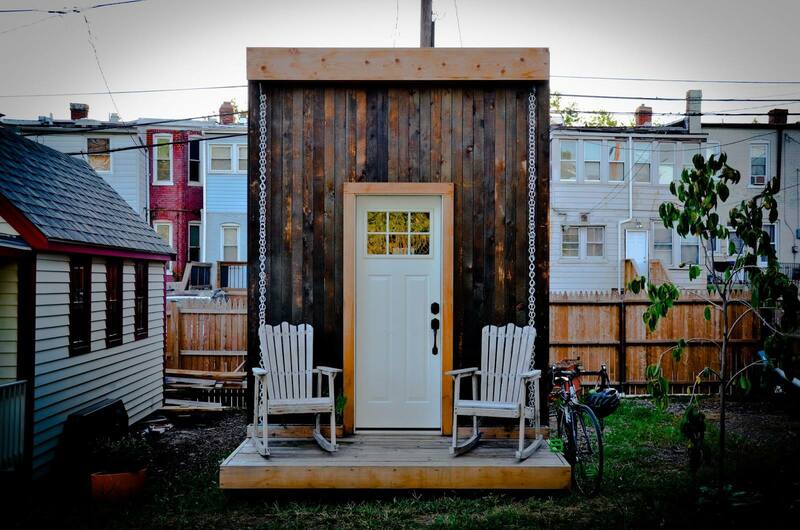 OM Build in Madison, WI can construct a Tiny House with the same amenities for $5,000 per unit. That means forty (40) homeless men and women could be housed for the same cost as one (1) HF apartment. Somebody must be getting rich off of this Housing First scam here in Boulder, CO. Don’t hold your breath waiting for any criminal investigation, however . . .
> Tonight at my campsite, for all of the owls I hear around there at night: all-you-can-eat voles. This entry was posted in Homelessness, Only in Boulder, Politics and tagged cyberstalkers, Earth Hour, Housing First 1175 Lee Hill, marijuana trafficking indictments on March 26, 2015 by homelessphilosopher. BTW, I wonder, how do the fish enjoy all of the human waste deposited in Boulder Creek from Eben G. Fine Park and elsewhere downstream? It was Jim Budd who proposed officially turning over this park to the bums a few years ago, when he was the darling of Boulder’s homeless shelter/services industry and the go-to source in re homelessness for the Daily Camera. 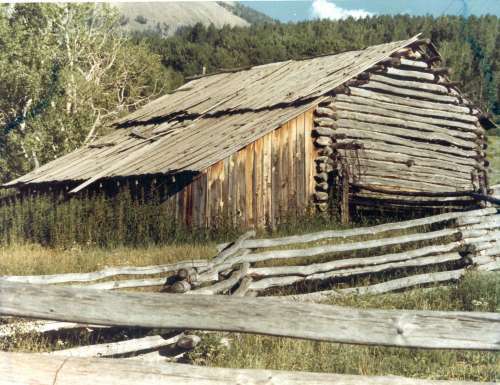 > Interesting story from Lyons, CO also in the DC: Lyons voters reject proposal for flood replacement housing at Bohn Park. Counting only the word “I” and not any other personal pronouns, young Kate used it no fewer than seventeen (17) times in her commentary. This focus on self will NOT help Ms. Richardson when she enters the Real World as it exists outside of Fairview High School in Boulder, CO.
> It’s snowing now in north Boulder (at 9:30AM), according to the National Weather Service, but I expect to be quite cozy in my burrow reading a book and snacking on unhealthy foods. I can afford to take a day off from playing the role of humble beggar at N. Broadway & U.S. 36, leaving that to the Housing First residents from 1175 Lee Hill who wish to panhandle there — despite all of the cash benefits and other social services they receive from taxpayers. 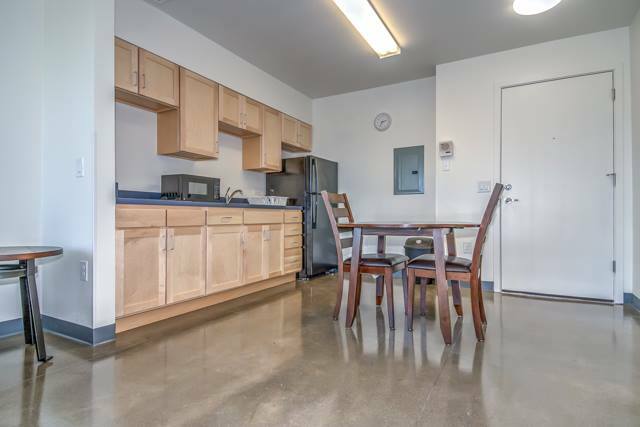 I make do with no more than what my kindhearted supporters freely choose to donate, and I live better than the HF “clients” do, even without a brand new $200,000+ apartment in permanent supportive housing. This entry was posted in Homelessness, Only in Boulder, Politics and tagged Boulder Civic Area, Bridge House, Eben G. Fine Park, Jim Budd, PARCC protest on March 25, 2015 by homelessphilosopher. Don’t misunderstand, I think it’s great to help Boulder County’s own homeless people — especially families with kids. 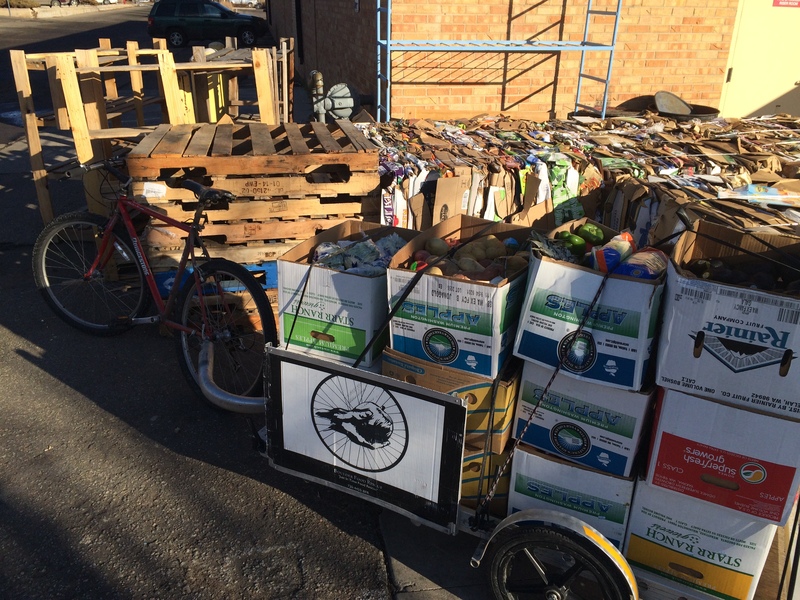 I applaud that part of Boulder Food Rescue’s mission. Aiding the sociopathic and parasitic bums from Denver and elsewhere, whose “mission” is to trash themselves and their surroundings wherever they travel, is another matter entirely. The only help they should each be given is the $5 bus ticket on RTD back to the Mile High City, along with a couple of peanut butter and jelly sandwiches and a bottle of water to-go . . .
As to the issue of food waste, I see this firsthand every morning in the dining room at Boulder Shelter for the Homeless — “clients” load up their trays with food, throw half of it away, and then go back for seconds. 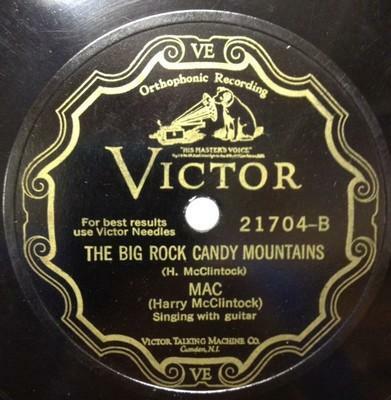 Apologies to Harry McClintock, who wrote and performed these lyrics back in Great Depression days, but there have been many different versions of the song by various artists (including Burl Ives) down through the years. Consider my slight revisions to the words as an update, reflecting our circumstances here circa 2015. Read Cut the crime rate: close Bridge House. This entry was posted in Homelessness, Only in Boulder, Politics and tagged Big Rock Candy Mountains, Boulder Food Rescue, Boulder Shelter for the Homeless, Bridge House, transients on March 24, 2015 by homelessphilosopher. April 15th will be the last night this season. Good riddance to this year’s crowd of bums from Denver and elsewhere! It’s so much quieter and cleaner during the six months over the summer when this place is only open from 6-8AM every morning . . .
Part of the problem has been so many new staff members at BSH who apparently haven’t been properly trained to deal with the “clients” they’re supposed to supervise during the overnight hours. Example from yesterday morning: As I was waiting at the north door for the facility to open at 6AM, I observed yet another new homeless guy come into the area by the front intake office with one of the newer female employees. In my opinion — speaking as one who has previous work experience at homeless shelters in other cities — there’s entirely too much casual conversation in the guise of counseling going on at BSH and this episode went beyond that. The young lady perched on the counter, as the homeless guy paced back and forth, and at one point he stood closer to her than seemed appropriate to me. Within a few minutes after their talk began, which I’m happy NOT to have been able to hear, her legs were beginning to swing back and forth as she sat on the counter. Excuse me, but this is the body language of a woman beginning to respond to a man’s come-on; it’s NOT what you would expect from anyone in a position of authority over some transient from who-knows-where. Altogether, they conversed/flirted for 15 minutes, before it was time to open the door for us hardy outdoor-types to enter. If the Homeless Philosopher were to be put in charge of training staff, I’d drill one lesson into their heads above all others — homeless people are almost always in full BS mode whenever they’re talking to anyone in authority. You must take whatever they say with that in mind, or the bums are certain to bamboozle you. Believe me, the young lady in the incident described above can’t possibly be lacking for the attention of men who are her peers, being rather good-looking (albeit naive). The [Boss] Can’t Keep Me Down! Maybe they all expect to be trustafarians, in which case a lot of them are bound to be traumatized by reality. 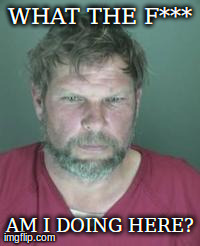 > Too many violent, crazy characters are wandering around as evidenced by recent crimes in Longmont, CO. Civil rights? Humbug! Society has a right to protect itself, and this has been forgotten in too many cases. The killers need to be in secure psychiatric facilities 24/7 forever; there’s no effective treatment for these poor souls. Tonight at my campsite: Whatever I find on sale this morning at King Soopers on Table Mesa. 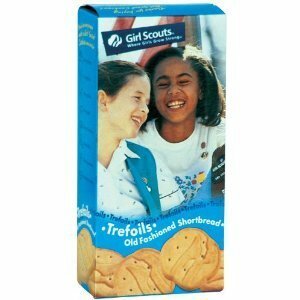 This entry was posted in Homelessness, Only in Boulder, Politics and tagged Boulder Shelter for the Homeless, Girl Scout cookies, staff training, standardized testing, trustafarians on March 23, 2015 by homelessphilosopher. > As I had nearly completed my morning stroll across CU’s Norlin Quad, and was once again perplexed by the display of Pink Crosses near Norlin Library, I spotted something new: two sandwich boards had been set up by the west library entrance proclaiming that CU is a SMOKE-FREE campus. All around were cigarette butts; it seems to me that it would have been wiser to clean up the smokers’ trash first, before announcing anything SMOKE-FREE. I’m glad that CU is trying, anyway. > Great column by Sean Maher, which I just noticed this morning, What is Boulder afraid of? As for me, I’m delighted by both residential and commercial development I see, except for the Wet House at 1175 Lee Hill. What does this mean, a RIGHT to rest? Nancy Peters asks, “What are your chances of being harassed, ticketed or arrested in Colorado for simply trying to exist as an unhoused person?” For me, the answer is ZERO despite the fact that I’ve lived as a homeless man in the same north Boulder neighborhood for over seven years. I have no difficulty at all with either law enforcement or with my neighbors in my daily life; this is because I don’t behave in a drunken, obnoxious, self-centered way which is calculated to attract the attention of the authorities as a de facto form of protest. I speak out directly to issues which concern me, and do-gooders coddling the small minority of homeless people who are (in effect) giving society the finger is of GREAT CONCERN. A pox on the bad actors who make all of us look like bums, and another pox on their apologists/enablers who are making homelessness into an industry that perpetuates the problem, neither “ending” it nor effectively “addressing” it. No, not at all. 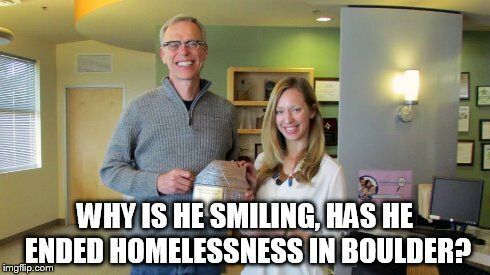 Greg Harms does make $90,000 per year as executive director of Boulder Shelter for the Homeless, however, so why shouldn’t he be happy? Cute blonde, too. Back then, I had a narrow definition of heroism. My conclusion that Mr. Yoshioka lacked courage arose from ignorance, as later I would learn. After you have suffered great losses and known much pain, it is not cowardice to wish to live henceforth with a minimum of suffering. And one form of heroism, about which few if any films will be made, is having the courage to live without bitterness when bitterness is justified, having the strength to persevere even when perseverance seems unlikely to be rewarded, having the resolution to find profound meaning in life when it seems the most meaningless. Wow! Great piece of writing. Have a good weekend, everybody! Back on Monday. This entry was posted in Homelessness, Only in Boulder, Politics and tagged apologists/enablers, CU smoke-free, Greg Harms, homelessphilosopher, Right to Rest bill on March 20, 2015 by homelessphilosopher.